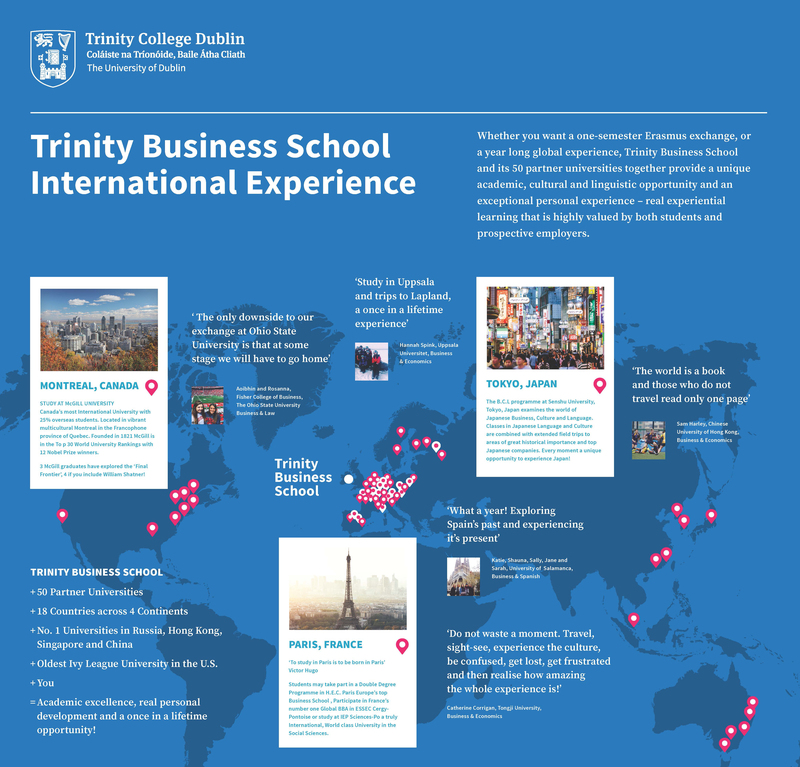 Trinity Business School warmly welcomes Erasmus and international visiting students from all around the globe. You may attend modules at Trinity College for just one semester or the entire academic year (Michaelmas, Hilary and Trinity Term). Students must be nominated by their home university and may take most modules on offer in the second, third and fourth years (with the exception of BU4501 Strategic Management). We expect one-year Erasmus students to follow both halves of any one-year module. The welcome meeting for Hilary term visiting students in Business, Economics, Sociology, Philosophy and Political Science will take place on January 15th at 6pm in the JM Synge Theatre, Arts Building. More information on how to apply to come to Trinity as a visiting student is available from the International Office webpage. The Buddy System was set up in 2013 to help exchange students integrate with Trinity students on an academic and social level by providing them with a Trinity student as a ‘buddy'. Read more about it here. Office hours for Exchange Co-ordinator: Tuesdays & Thursdays, 9.30am to 12.30pm. Trinity Business School, Áras an Phiarsaigh, Undergraduate Office, 3rd Floor.